Sonoma County, where CrossCheck is located, tops Napa Valley as the Best Wine Vacation, according to the annual travel rankings revealed June 20, 2017, in U.S. News & World Report. Napa came in third; Italy's Tuscan wine region came in first. This is excellent news. 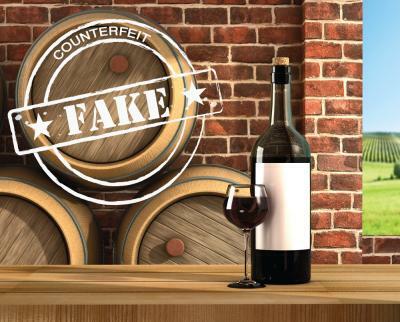 However, when you have a successful (and profitable) product that is in high demand, in some cases to the point where the winery is sold out of a certain product, this creates an opportunity for counterfeiting. A recent BBC Radio 4 documentary, called The Wine Detectives, estimated that up to 20 percent of the fine wine market may be counterfeit. Someone may buy up original bottles and corks on the web and fill them with a similar but obviously cheaper substitute, seal them, and resell them to collectors, many of whom could never tell the original wine from the counterfeit. A sophisticated winemaker might try another approach: create your own bottles, labels, paste and a wine with similar characteristics to the superior wine, and produce the inferior wine on a large scale. A third approach is to create wines that never actually existed in the year, appellation, brand, terroir, etc., you print on their labels. Techniques exist for checking authenticity. Glue and paper labels can be forensically dated. The corks may have extraction grooves. Lead caps crease more easily than aluminum ones. Nobody is going to counterfeit a $20 bottle of wine, but at higher price points it becomes more plausible. Relying on a knowledgeable, trusted, local wine expert whom you know personally is your best defense. Payment professionals are familiar with the emergence of "fintech," but did you know that there is another recent development, which I call "winetech"? (I just made up that term). In "Ignore the Snobs, Drink the Cheap, Delicious Wine," New York Times wine writer Bianca Bosker noted the emergence of "industrially farmed grapes which are manipulated and tailored to fit predetermined specifications, based on audience research." Producers can now use chemical shortcuts to develop consistency and stability and mimic high-end wines. This is a more subtle form of counterfeiting that takes advantage of discoveries in scientific wine research. So much for terroir. Counterfeiting exists in the payments space as well. While most readers of The Green Sheet are focused on credit card processing, it is useful to know about the other types of payments your clients make in the course of their daily work. When you know what your clients go through every day to process payments, it helps you to understand their pain points, and enables you to come up with solutions, or at least try to, which gives you credibility in the eyes of your clients. The second most targeted area researchers identified was wire transfers, which are always high dollar and the scariest for banks. Third place went to corporate and commercial credit cards, followed by automated clearing house (ACH) debit fraud. One howler in the report is "ACH is considered more secure than check," which contradicts my experience working in the cash management department of one of the largest California banks, where we viewed ACH as so risky that a new ACH originator had to be signed off by the bank's Chief Risk Officer. I believe fraud will increase with "same-day ACH," since it cuts a day out of the traditional clearing and settlement time for transactions. This leaves less time for banks to monitor incoming requests and validate the withdrawing parties. Same-day debit processing could introduce a lot more unauthorized returns, and previous methods to detect this will no longer be available. A relatively new factor is business e-mail compromise. This happens when somebody has compromised a firm's legitimate business email through social engineering or computer intrusion techniques. An employee gets what looks like a legitimate email from his or her boss (CFO or Treasurer) directing the individual to make a quick wire transfer to close a deal. All that is required to ferret out fraud is for the recipient to phone the sender on the phone to verify the request. I would view check and wire transfer fraud as very manageable issues that can be controlled by traditional management practices applied rigorously. This is common in large enterprises, which are audited by public accounting firms, but not so for small and midsize businesses. Corporate credit card/purchasing card fraud is almost always attributable to "bad employees" who are using cards for unauthorized purchases. Visa has pushed corporate cards for 20 years with minimal traction because of the horror stories associated with this product, which I do not need to rehash here. It is no easier to reconcile a bankcard statement than a bank statement. I would argue that with bank-positive pay updated from the firm's general ledger system, it is easier to reconcile the checking account. It is a lot more expensive to use a corporate credit card than to write a check, so I see no rationale for using a corporate purchasing card, except to create new revenue for the issuing bank. It is disingenuous to pretend otherwise. Your customers have more on their minds than choosing a new vendor to process credit card transactions. The more you know about your customers and prospects, the better able you are to meet their needs. Now I want to return to fintechs, which will transform the payments world with next-generation, tech-driven offerings. When calling on clients and prospects, your success does not depend on a technology-first strategy. It depends on listening to them and finding ways to make their lives easier. Keep in mind that most fintechs will fail in their first few years from lack of capital or because their products don't get traction in the marketplace. Technology will drive some disruptive innovation, but the small businesses you are calling on have operational and management needs they want to address right now. Your goal is to enhance the customer experience with your company's products and services. If you constantly improve your customer experience, you can never go wrong. Your competitors won't be able to "counterfeit" that.